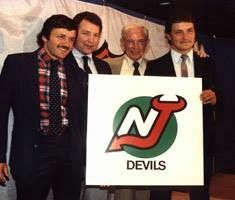 Prior to the 1978 – 1979 season, owner Jack Vickers sold the team to New Jersey trucking tycoon Arthur Imperatore, who announced that he wished to move the team to the New Jersey Meadowlands. The NHL vetoed the move since the Brendan Byrne Arena was still being built, and there was no suitable temporary facility in the area. In 1979, the team hired Don Cherry as head coach and traded for Maple Leafs star Lanny McDonald. Despite these moves, the Rockies still posted the worst record in the NHL. They played the next two seasons with the possibility of moving until May 27, 1982, when Imperatore sold the Rockies to another New Jersey millionaire, shipping magnate John McMullen (who also owned Major League Baseball’s Houston Astros). McMullen’s first act was to announce that the long-expected move to New Jersey would finally come to pass.